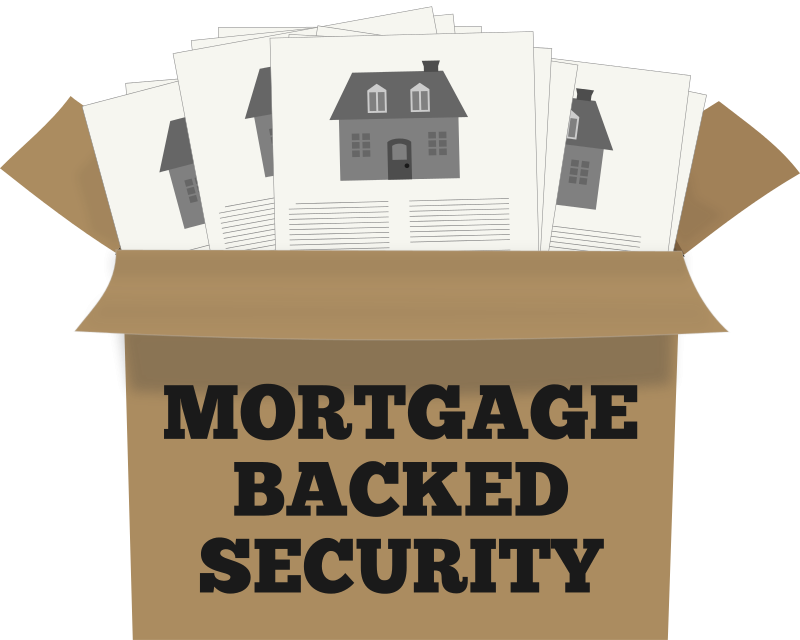 A mortgage-backed security (MBS) is a type of asset-backed security that is secured by a mortgage or collection of mortgages. This security must also be grouped in one of the top two ratings as determined by an accredited credit rating agency, and usually pays periodic payments that are similar to coupon payments. Furthermore, the mortgage must have originated from a regulated and authorized financial institution. An MBS is also known as a “mortgage-related security” or a “mortgage pass through.” An MBS can be bought and sold through a broker and the minimum investment varies between issuers. It is issued by either a federal government agency company, government-sponsored enterprise (GSE), or private financial company. An mortgage-backed security is a way for a smaller regional bank to lend mortgages to its customers without having to worry about whether the customers have the assets to cover the loan. Instead, the bank acts as a middleman between the home buyer and the investment market participants. When an investor invests in a mortgage-backed security, he is essentially lending money to a home buyer or business. This type of security is also commonly used to redirect the interest and principal payments from the pool of mortgages to shareholders. These payments can be further broken down into different classes of securities, depending on the riskiness of different mortgages as they are classified under the MBS. There are two common types of MBSs: pass-throughs and collateralized mortgage obligations, also known as CMOs. Pass-throughs are structured as a trust in which mortgage payments are collected and passed through to investors. Pass-throughs typically have stated maturities of five, 15, and 30 years. Adjustable-rate mortgages(ARM), fixed-rate mortgages and other types of loans are pooled to create pass-throughs. The average life of pass-throughs may be less than the stated maturity, depending on the principal payments of the pool of mortgages. Collateralized mortgage obligations (CMO) consist of multiple pools of securities, which are known as slices, or tranches. The tranches are given credit ratings, and the rates that are returned to investors depend on the tranches. For example, pools of securities in the senior secured tranche typically have lower interest rates than those in the unsecured tranche, due to the low degree of risk assumed in the senior secured tranche. Mortgage-backed securities played a central role in the financial crisis that began in 2007 and wiped out trillions of dollars, bringing down Lehman Brothers and roiling world financial markets. At the core, an MBS allows a bank to move a mortgage off its books by turning it into a security and selling it to investors. When a bank is able to move mortgages off the books, it frees up room for more lending capital. With investors encouraged by the traditional strength of the housing market and the ratings on MBS, there was steady demand for these repackaged mortgages. In retrospect, it seems natural that the demand for MBS would encourage banks to reach further down in creditworthiness to supply more to eager investors. So the MBS market started seeing more subprime MBS. With Freddie Mac and Fannie Mae also aggressively supporting the mortgage market, the quality of all mortgage backed securities declined below their increasingly meaningless ratings. When subprime borrowers began to default, the housing market tightened and then began to collapse, hurting even conventional mortgage holders. More and more people walked from their mortgages and the primary assets underpinning the MBS market saw steep declines. The avalanche of non-payments meant that many of the MBSs and collateralized debt obligations (CDO) based off of the pools of mortgages were vastly overvalued. The market for MBSs dried up and losses piled up as institutional investors and banks attempted to unload bad MBS investments. Credit also tightened, causing many banks and financial institutions to teeter on the brink of insolvency. The U.S. Treasury stepped in with the $700 billion bailout to mitigate the credit crunch, but it was the Federal Reserve that led the charge on creating a market for unloading the MBSs. The Fed bought $1.75 trillion in MBSs directly while the Troubled Asset Relief Program (TARP) injected capital into banks. The financial crisis passed, but the total government commitment, implicit and explicit, was much larger than the $700 billion figure often reported. MBSs are still bought and sold today. There will always be a market for them simply because people generally pay their mortgages if they can. The Fed is still holding that trillion plus chunk of the market for U.S. originated MBSs, but it has announced that it will start selling off its MBS holdings starting in 2017. Even CDOs have returned after falling out of favor for a few years post crisis. So two of the main culprits in the financial crisis are still in session, but the assumption is that Wall Street has learned its lesson and will question the value of MBSs frequently rather than just blindly buying them. Time will tell, however, and you know what they say about assumptions.